This acrylic painting was a piece I did last year in my formations class. The goal was to show a relationship between warm and cool colors. 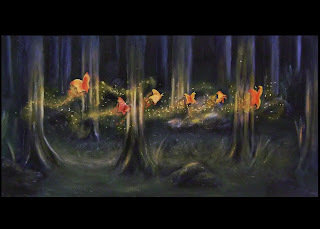 I guess the story behind this was that there's a certain place in a dark forest where the butterflies always travel in packs (or whatever you call a group of butterflies). Alot of my paintings/drawings are fantasy oriented, maybe its time to make some realistic paintings. 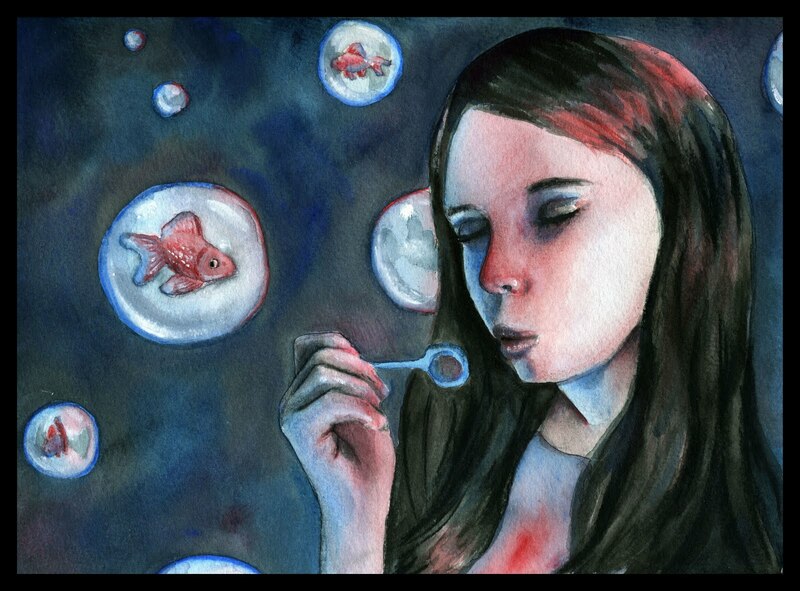 For my illustration class we had to illustrate an idiom/proverb/figure of speech. 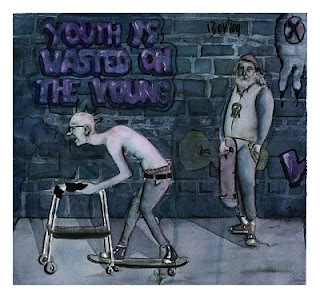 I chose "Youth is wasted on the young" for mine and i chose to depict some old pathetic men skateboarding. After this I realize that my subjects and ideas are ok, but I really need to work on technique. I used watercolor and a black watercolor pencil, but I need to be less messy with the pencil. I also shouldn't try to attempt something I know that I can't do; I should leave graffiti to the experts. If I'm going to try it, it should be on my own time and not on a final project. Over the Christmas break I'm going to do simple watercolor pieces so I can practice technique. I really need to work on things looking more professional. Hopefully in the future I'll have more good things to say about my artwork and stop ripping on it so much. In the meantime I will continue to practice and create things that will enhance my learning but not bring in any income. My inspiration for this character first came from the E. E. Cummings Poem In Just. 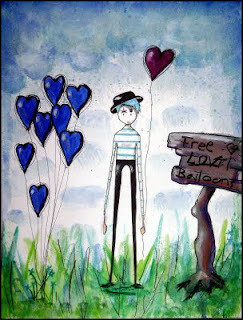 The poem speaks of a balloonman and it's a pretty whimsical poem - which is what I wanted to achieve in the mood of my paintings. 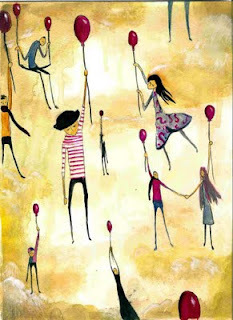 So I started off with my painting, To Catch a Ride On A Red Balloon. I was really happy with it and it was the first time I ever used the Parisian style of art. 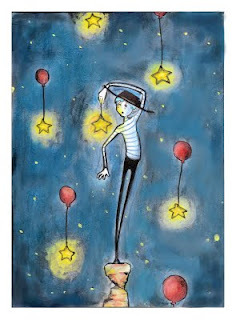 From then I created a painting of a single figure which later I named "The Balloonman." Since then I've done numerous paintings of him, and whenever I doodle, it's mainly of him. The one painting above with him reaching for the stars is my latest one of him. His appearance has changed over time, especially with the size of his hat. My old paintings of him used to be a lot more mellow and sad; he's usually a lot happier nowadays. P.S. If you've noticed, one of his eyes is stitched up. I wanted him to be physically handicapped in some way, btu I still have no story as to why he only has one eye.